Back at La Boulangerie de San Francisco I felt I couldn't resist this lovely (not so) little round cream puff donut like thing that was calling my name. Seems it is called a tropezienne and can come in larger sizes too! 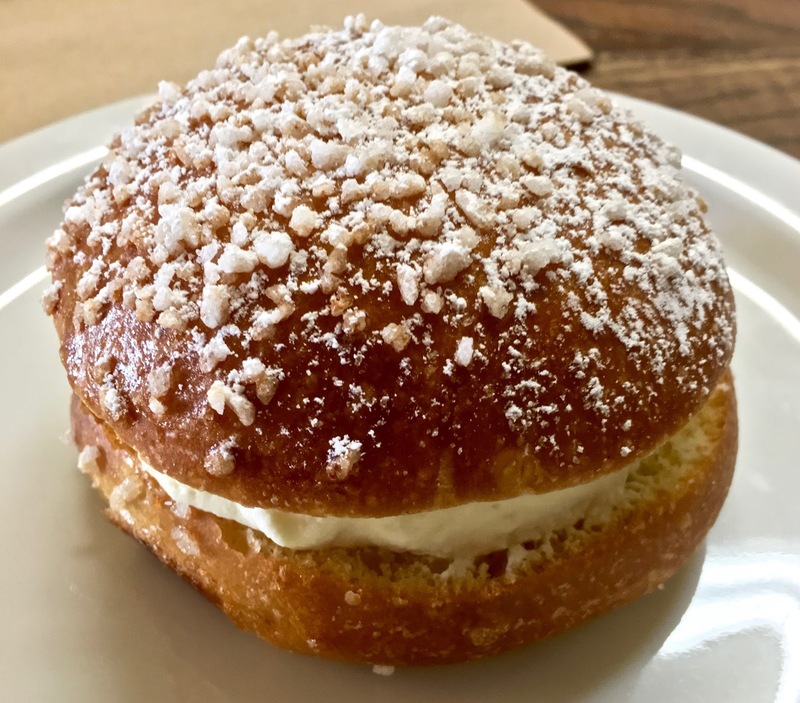 It's a brioche cake bun with puffy thick cream filling and coated with sugar granules and powdered sugar. It's almost like a round eclair without the chocolate. This one was about the size of a regular hamburger for $3.50. The minute you bite into it the cream comes gushing out and luckily enough there is enough of the filling to go with every bite. The bread is somewhere between a brioche bun and donut--sturdy yet still fluffy. The sugar on top gives it a bit of crunch too. It is a dessert that seems light and airy but has the heft of a "real" dessert like I go for. I can only image this in a large tort form. Soft, creamy, crunchy, sweet goodness--enough to make me want to traverse back across town to the Fillmore District to get another one. All you can eat in San Francisco?!! I'm gonna be all over that Farmer Brown one! Yeah, so I know this isn't SF specific, but seriously, if this comes to town I'm gonna have to try it. Those famous NY halal guys have finally found a spot--in the Tenderloin--that new hotspot of trendy dining. Food Inc. on Divis is closing after 20 years. I hadn't heard of them either but they managed that long under radar. Sparky's Diner seems to have met a similar fate. Or has it? This sparse, tiny, set price and dishes places has finally opened. Let's wait and see if it takes off. Alfred's Steakhouse has reopened and it seems to be a big deal for many in town. Google takes on Amazon (again) with instacart grocery food delivery service. Guatemalan hot dogs are back in business and you can get your late night Mission drunk on for one. Reveille Coffee Co. has finally opened their cafe in Mission Bay. You get check them out for breakfast, lunch and dinner. They have an extensive menu from a chef formally of Hops & Hominy. Is San Francisco really obsessed with Japanese cuisine? Even Rainbow Grocery, that bastion of left leaning workers co-op is overwhelmed by the homeless tent city nearby. As Samovar Tea Lounge in the Castro closes, Le Marais Bakery moves in. Restaurant spaces don't stay empty too long. Joe's Of Westlake is also making a comeback after two years.